We are starting to get spoilt for choice these days when it comes to themes, mostly because they're no longer just themes. Look at what Shape 5 have released this month and now look at what RocketTheme have released as a bonus theme! 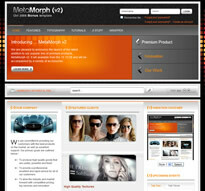 MetaMorph v2 is based on MetaMorph, that was released in August. I feel quite stupid writing that bit, as it's quite clear what it's based on, but something needed to be said. It actually looks really quite different and if they had taken away the title, I might have said there was a little bit of Terran Tribune in it too, but I've had a beer and I have no beer goggle hold on this post getting published. Anyway, it's got everything you'd expect from RT and loads of smart features - I particularly like the blue one so I hope not to see it anywhere, as I suspect it might be getting published very soon on my own personal site.